I asked to God empty my pride and bless me with humility. The things that happened next really blew my mind. I could have sworn I was humble! Perhaps not the world’s most humble, but I took pride in my humility. Perhaps those who saw pride in me were just folks who are unfortunately myopic, and well, that wasn’t my fault…or was it? All I know is that I have been strong for too long, for me. I grew up defensive because I was constantly hurt by the folks who ought to protect me. I was always looking out for myself, and whoever messed with me had to go through me first. I always dealt with folks with plenty of tact, so I didn’t seem rude. At least, not in ways that you’d blame me for. That always counted for me. I was proud of my humble self! But I’ll have to admit now, that looking out for oneself is not a bad thing. You’ve got to have a strong sense of self…of worth…of value in not just who you are, but in what you can achieve when you open up yourself to being the best you can be. Looking out for yourself should not be the primary motivator too. It will pull some dangerous energy out of you that would be much more productive if channeled in the right course. Trust me, you don’t want to go around with your head cocked like Agama all the time, with the idea that the world is made up of you alone, and with your eyes going to and fro every now and then, looking for who wants to devour you. A victim mentality never adds to anyone. If you want to grow like you should, you’ve got to put that away. All those things you’ve had to experience in the journey along your creative path are not as coincidental as you think they are. They might not even seem like they correlate with the things you’re trying to build. Nature has a way of rewarding you with conflicts when you chase your dreams. Pray for money and you can be sure that it won’t rain down on you in a flash. Pray for a spouse and she won’t just appear in your bedroom gigling like a little girl. If that were the case – my dear – you’d better run! Here’s what you’ll have: Opportunity. Opportunities abound everywhere…to make more money…to meet that special lady; the truth is, going shopping at the mall at that time you did with Greta and George might have been a bother but you’d never have thought that the mall held your miracle, and that chance meeting was not a coincidence. Focus. Don’t try to jump the stairs because you’ve got long legs! It might have worked well for you at the beginning but as you grow older you’ll hurt yourself, and you might not have anyone around to nurse your wounds because you won’t be a baby anymore. Don’t truncate the process. Go through the school of life with meekness. Put the lines upon lines, and precepts upon precepts. And the events will turn up…a world of experiences; a little here, a little there. 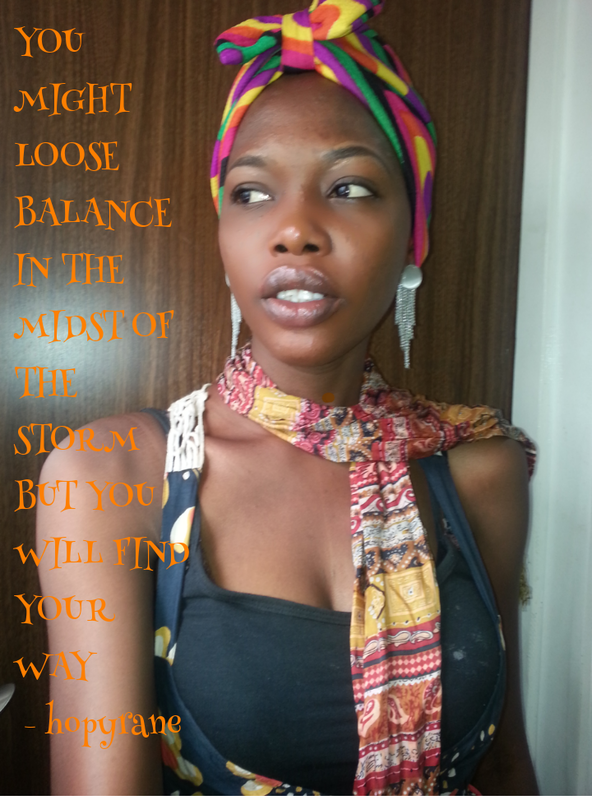 You might loose balance in the midst of the storm but you will find your way. And you’ll look back someday with profound gratitude, at the chunk of opportunities that has helped shape your life. As for me, I finally got it. You can’t give awards for humility. It’s just absolutely…contradictory. If you were to give an award to a really humble dude, would he have accepted it? Now I’m thinking to let patience have its perfect work. Oh dear, I’d better not ask the Lord, even though I know He must be smiling at me and shaking His wonderful head at how silly I can be. I know God will answer already, even though I won’t ask. It is scary (a litttle bit) but I can tell He knows the challenge is good for me.